Learn how to enable Instagram as an event sharing option within PicPic Social. The PicPic Social app allows your guests to share photos directly to Instagram. This guide will instruct you on how to enable Instagram sharing within your event settings. Instagram Wall Message - Enter a message that will be shared with each photo. You can include @mentions and #hashtags. 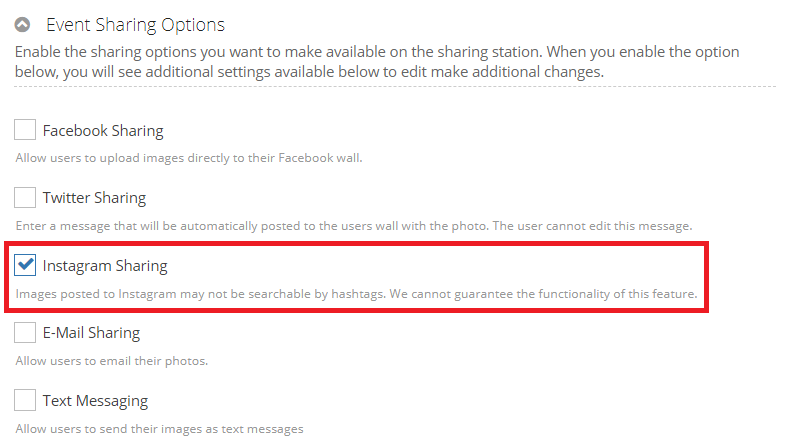 Allow user entered message - Enable this to allow users to enter their own message on the sharing station when photos are being shared. Share photos as video so hashtags are searchable - Enable this feature if you want to be able to search for the the images posted from sharing station under the same hashtag.